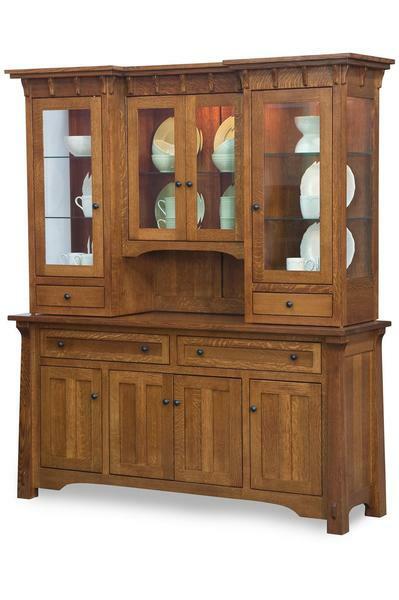 This expertly handcrafted Amish Manitoba Hutch is full of custom options and ample storage space to fit your dining needs and style preferences. The stunning features of the Manitoba Mission style will grab your attention as soon as you walk into the room. Add to this beautiful style and create a custom look by choosing extra features from our available options list for a unique one-of-a-kind Manitoba Hutch designed by you and handcrafted by our talented Amish woodworkers for your home alone. When this brilliantly crafted custom Manitoba Hutch is finished you will have left your own personal fingerprint on this unique piece so that you will see a piece of yourself in every detail of this solid wood piece of Amish carpentry. If you like the look of this Amish Manitoba Hutch, check out some of our other handcrafted custom furniture built in the Manitoba style, including the Amish Manitoba Sideboard, the Amish Manitoba Buffet, and the Amish Manitoba Wine Cabinet. Be sure to also check out all our other many handcrafted Amish Hutches. 4 Door Hutch with 42" width is standard. Call for additional pricing for doors.